Photo Art, March 1965, titled 'Yama no matsuri'/'Mountain Carnival'; Yamagishi (ed. ), Warabegoyomi, Chuokoron-sha, 1971, n.p. 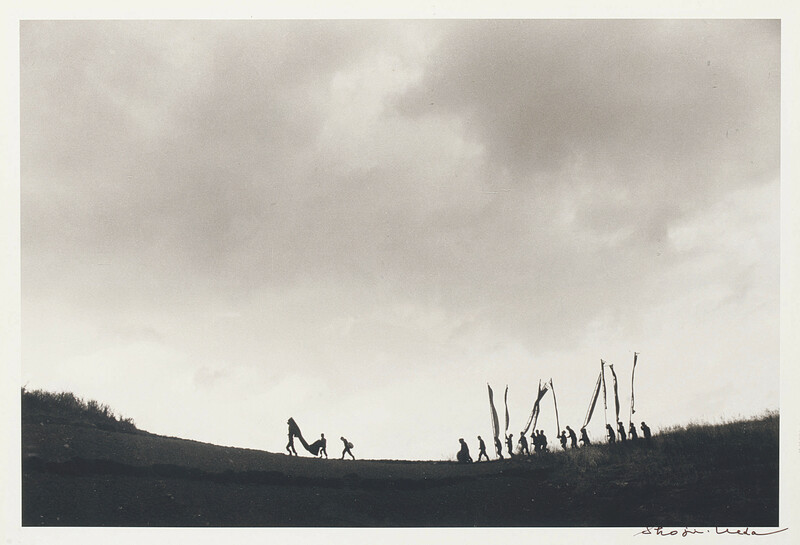 (fig.A); Ueda, Sand Dunes/Seasons of the Children, Asahi Sonorama, 1978, n.p. ; Ueda Shoji: Showa shashin zenshigoto series 10 [Showa-era Photography, The Complete Works, Vol.10], Asahi Shinbun-sha, 1983, p.103; Ikegami & Nakayama (eds. ), Shoji Ueda, East Japan Railway Culture Foundation, 1993, p.103, pl.80; Ueda Shoji: Nihon no shashinka 20 [Japanese Photographers, Vol.20], Iwanami Shoten, 1998, pl.37. Tokyo, Zeit-Foto Salon, Paysage avec les hommes II, 17 March -- 5 April 1980 and Paris, Picto Bastille. The present lot is the earliest large-format exhibition print Ueda made of this image. His vintage prints are traditionally in small format and were made to be reproduced in magazines and books. The Ueda Shoji Museum of Photography in Tottori Prefecture holds the only known vintage print of this image. In 1955, Ueda began his important series Children the Year Around focusing on the lives of the children throughout the four seasons in his native San'in region along the coast of Sea of Japan. Works from this series were shown at the International Center of Photography, New York, in the 1979 exhibition Japan: A Self-Portrait, curated by Yamagishi Shoji and Cornell Capa. Having survived the chaos in the wake of its defeat in World War II, Japan began its swift and unfaltering climb towards becoming an economic power. It was a tumultuous time when many values, new and old, clashed fiercely. For example, students clamored for revolution and social reform in the 1960s and early 70s in response to the conservative political system promoted by the government and the dominating classes. Within this social climate, the tendency to reject existing values was also embraced by the arts and the pursuit of new possibilities and new forms of expression became prevalent. Photography was no exception. By the end of the 1950s, a self-managed photo agency called VIVO was established by six photographers -- Tomatsu Shomei, Narahara Ikko, Hosoe Eikoh, Kawada Kikuji, Sato Akira and Tanno Akira -- and exhibited works that went against established forms of photographic expression. VIVO gave birth to such significant works as Hosoe's Otoko to Onna [Man and Woman] (1961) and Kawada's Chizu [The Map] (1965). Innovation in photography of the 1960s and early 70s was symbolized by Provoke (1968-70), the famed photographic doujinshi [self-published magazine]. One of the members of the PROVOKE collective was Moriyama Daido. The coarseness of Moriyama's photographic images, as seen in a number of his works offered here, was brought on by a spirit of rebellion against existing photographic aesthetics, which called foremost for beauty and grace. Moriyama's Shashin yo Sayounara [Farewell Photography] (1972) is a photobook that marked the peak in this revolution of photographic expression. At this time, the practice of exhibiting photographic works in museums and galleries was still underdeveloped in Japan; hence, the primary method of introducing new work was to publish in magazines and photobooks. The concept of 'original print' or 'vintage print' was virtually unknown. Publishing in magazines and books was the starting point for highlighting photography and these photographs in printed material were perceived as the originals. It is for this reason that photobooks from this period have a special value. Only in the mid-70s did the importance of exhibiting photographs in galleries begin to grow, as did the awareness among photographers of the importance of their prints. One of the first photographers to recognise the inherent value of the photographic print was Sugimoto Hiroshi. It was only in the 1990s -- with the advent of institutional photography collections and regular programmes of photography exhibitions -- that the public began to understand photography as prints. When it opened in 1988, The Kawasaki City Museum in Kanagawa Prefecture, where I am Curator of Photography, was the first public art museum with a section devoted to photography. The museum's very first exhibition was entitled The Development of Postwar Japanese Photography, 1945-1980. The Tokyo Metropolitan Museum of Photography, the first museum devoted to photography in Asia, followed in 1990. Today, we are witnessing a renewed interest in Japanese post-war photography and period prints from the turbulent decades on the 1960s and 70s are being discovered and highly valued. While awareness of the original print as an outlet for photographers continues to grow, emphasis on the value of photobooks shows no signs of diminishing. In Japan, the tradition of completing a photographic project in book form continues to flourish and outstanding photobooks are published each year. For contemporary Japanese photographers like Kawauchi Rinko -- whose photograph from her 2004 book Aila is featured in the sale -- fine prints and exhibitions are fast becoming as important as photobooks. The interaction between these two means of expression, the photographic print and the photobook, is what informs and enriches Japanese photography today. This traces back to the innovations in photographic expression of the 1960s to 1970s. N.B. In this introduction and in this section (lots 59-85), Japanese names are given in the standard Japanese order, surname first, except when they appear in Western order in titles of publications and in citations. The subject of his photography for over a period of fifty years has been the daily life of the people, particularly the children, of his native San'in. The skill of his delineation has a haiku-like lightness, filled with the flavour of the shifting seasons.